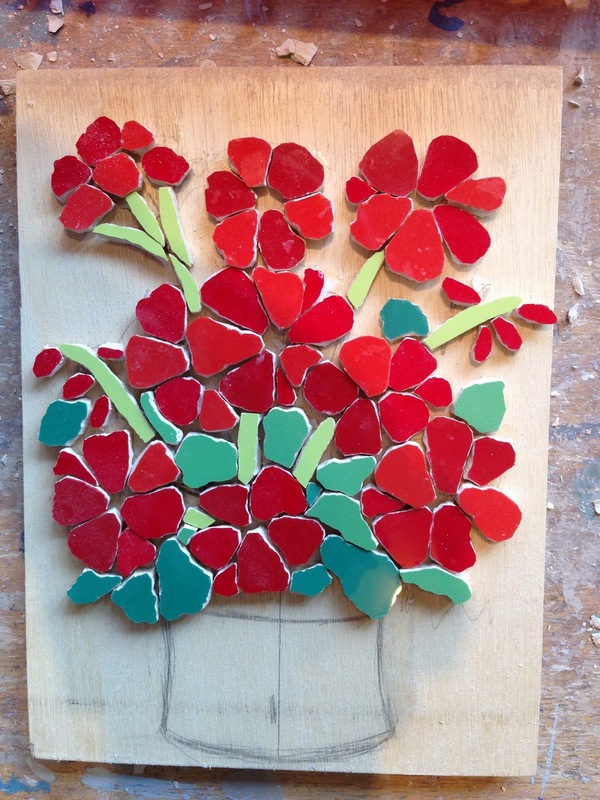 Felicity Ball mosaics: A step by step guide to making a red geraniums mosaic. 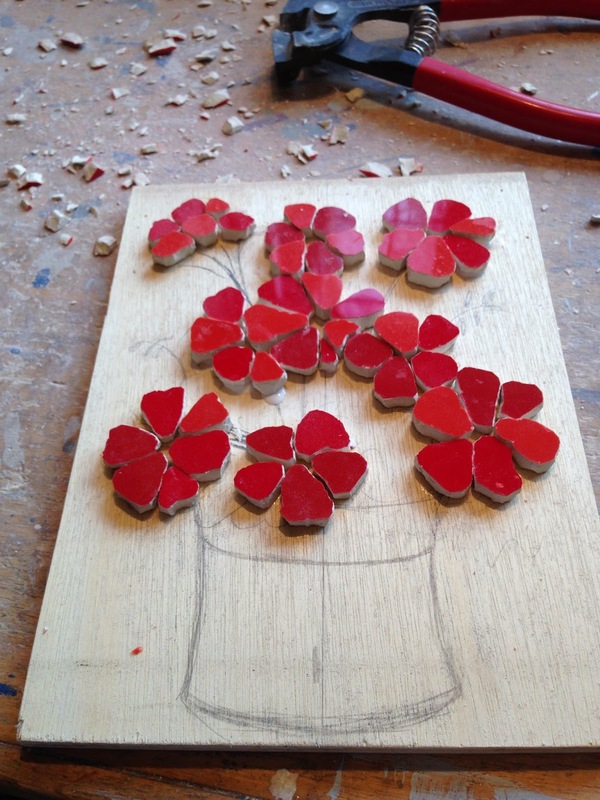 A step by step guide to making a red geraniums mosaic. With Mother's Day on Sunday here in the UK, I have been very busy making mosaic flowers. This was a rather special commission I received from a customer in America, who wanted me to make a red geranium mosaic in memory of her Mum, who loved them. 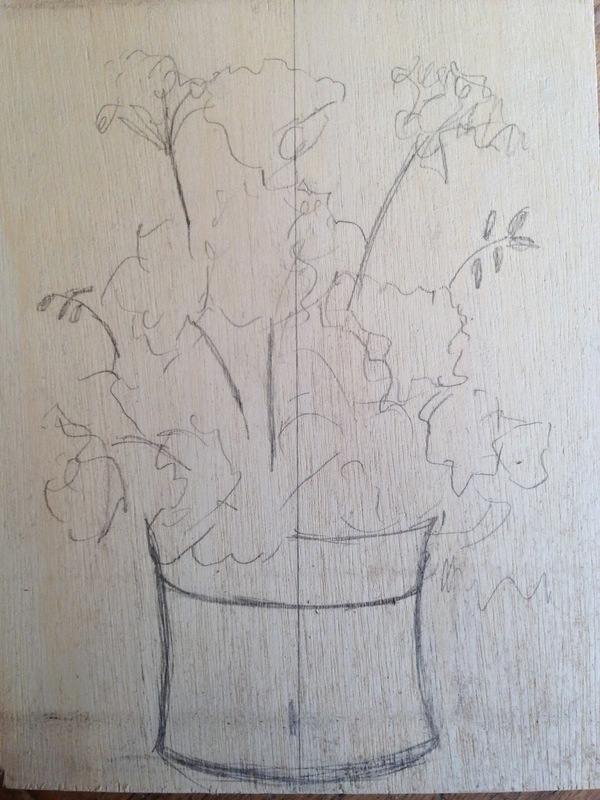 Having done my geranium research on Google images, I make a rough sketch of the pot and the flowers on a piece of exterior plywood. Then I cut the individual petals, using different depths of tiles and shades of red, to give the mosaic a real 3D tactile effect. I start sticking the petals on, closely referring to images of geraniums I have found online to make sure I get it as close to real life as possible. ..see how the blooms are coming on! Now to add some stems and foliage, seeing what shape the leaves are, and the different shades of green. Next it is the terracotta pot - I love this shape, and I have just the right tile colour and texture to use! Finally the blue background, reminding us of a Mediterranean sky - then grouting, cleaning, and painting the sides and back to finish it off. ...and there you have it - does it remind you of warm and balmy summer evenings?! 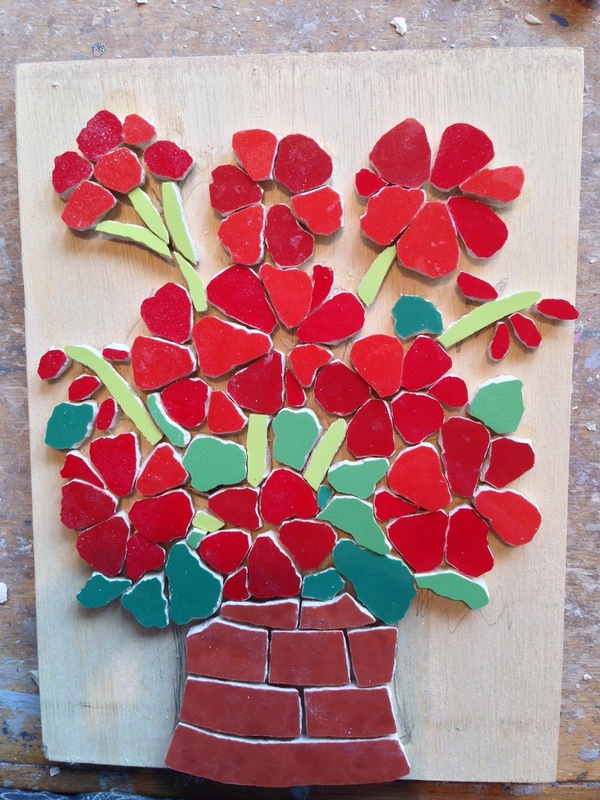 Thanks for leaving a comment - the geraniums mosaic seems to be going down well! That's very pretty. You had a good idea to use different reds and greens. It makes them look so real. This is amazing. I've been trying to do something like this as a present to my mother for Mother's Day, but have it be roses. I got the inspiration for it when she had mosaic tile put in her kitchen. I knew instantly what to get her for mothers day after I saw that. After this project I'm going to look into getting mosaic tile put in my kitchen, too. Thanks Seamus - give me a shout if I can help at all with any of your mosaic projects! Nice post it is helping me get good idea for mosaic tile. Very nice work ! do you have any site where the part of grouting is clear ? thankyou!! Hi there! Love your work! What kind of tile are you using, and how do you cut it? Thanks. A new mixed media mosaic from Just Mosaics! What's on eBay this week from Just Mosaics? Original mosaics for Mother's Day!